NCSBN is focused on establishing the validity and legal defensibility of the NCLEX-RN by ensuring it is comprehensive and that it aligns with the requirements of the nursing profession as it is currently practiced. To keep pace with the changing requirements of the job, NCSBN partnered with a research firm to conduct two studies as part of strategic job analyses of the RN job from 2012 through 2014. 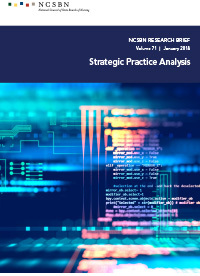 The Strategic Practice Analysis is the summary of their findings.